The term “comfort food” was first coined in the 70s, but the genre it describes has been around even longer. We all know dishes like fried chicken and apple pie have a special place in the heart of the American psyche. We think of tradition, of nostalgia, of sentimental appeal. And of course, of good eats. But the idea of comfort food extends across cultures too. Shake things up this winter by sampling a variety of cuisines, and take advantage of the many ways to enjoy a meal in good company, even as the days get shorter and the mercury drops. We first look to soup to warm us up. 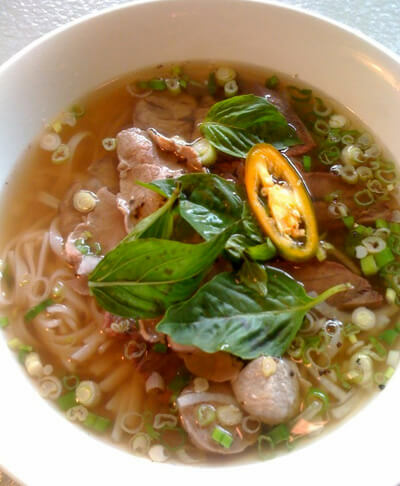 Instead of drab old chicken noodle, try a bowl of phở. Often eaten as a street food, this traditional Vietnamese soup has a strong fan base worldwide, and with lots of variations. At Downtown’s Saigon Surface, the Oxtail Pho ($10) is brimming with soft rice noodles, crunchy scallions, and tender, flavorful beef brisket. It can be tricky to pile everything into the deep Chinese-style spoon, but also sort of fun. Meatballs and thinly sliced beef provide extra sustenance in this hearty bowl, but they also offer a chicken version. Add a dash of spicy Sriracha sauce and some fresh basil or cilantro to the piping hot broth, and prepare to experience the ultimate cure for the cold outside. There’s more to winter than ice and snow; it’s also a time to connect with family and friends over an intimate meal. The cuisine known as dim sum means “a bit of heart” in Cantonese, and is traditionally enjoyed as a relaxed family gathering. At West Omaha’s New Gold Mountain, the tapas-style plates are ordered from a list, and brought out one by one. Each serving is enough for two to four people to have a taste—and perhaps to fight over the last bit. The menu comprises various balls, rolls, buns, cakes, dumplings, and even sticky rice wrapped in aromatic lotus flower leaves. Some dishes are sweet; many are savory. Others, like the Steamed BBQ Pork Buns ($2.75), are both: Chopped pork coated in a pink barbecue sauce, encased in fluffy–yet dense–sweet bread. The Pan Fried Turnip Cake ($2.75) is a compact square made from the shredded root vegetable, reminiscent of another comfort food fave, the potato pancake. Each item is strikingly attractive, intricately and meticulously prepared. At New Gold Mountain, the wait staff is warm and welcoming; the walls are a cheerful, inviting shade of yellow. A more enlivened winter meal would be difficult to cook up. Although summer grilling season is closed until next year, you can still have your beloved bratwurst at the Lithuanian Bakery & Kafe, where quality sausages are available all year round. Try a Combo Plate, which features a smooth, well-seasoned brat, and a smoked, juicy knackwurst, which is a lot like a hot dog, but better. The wursts are brought in from a Wisconsin sausage maker, and produced using the finest old world recipes. On the side, there’s no shortage of freshly baked rye bread, sauerkraut and authentic potato salad. Your sweet tooth can indulge in one of the decadent 25-layer tortes—a treat that reportedly takes three days to prepare and bake. Here you can delight in dishes made with extra love and care—the best ingredients for a comfort food classic. Our Canadian neighbors may know a thing or two about long winters, and perhaps that’s why their unofficial national comfort food has all the good stuff: crispy French fries, thick brown gravy, and fresh cheese curds. Known as poutine (by no coincidence related to the English pudding), you can try it at Omaha’s own New York Chicken & Gyros ($3.95). Here, they’re not overzealous with the cheese curds, which may be a good thing for cautious first-time Poutiners. The dish, for all its notoriously heavy ingredients, is surprisingly easy to manage. But still, the crunchy cubed spuds sop up the gravy in a way that will have you humming “O Canada” ‘til springtime. You will need a fork for this. Happily, you won’t have to travel far to find traditions from all over the world, so be sure to sample the stellar comfort food in Omaha this winter. Saigon Surface is located at 324 South 14th Street. New Gold Mountain is at 15505 Ruggles Street, just north of 156th and West Maple Road. Lithuanian Bakery & Kafe is at 7427 Pacific Street. New York Chicken & Gyros can be found at 1611 Farnam Street.